In March 2017, after not feeling well for over a year, Alyssa was diagnosed with histiocytosis disease. Even though she wasn’t feeling her best, she graduated that year with National Honor Society honors and received a scholarship from Valparasio University. She was excited to go to college and fulfill her dream of going into the medical field. But her plans changed when she developed a high fever while on family vacation that summer. In July 2017, Alyssa began to have breathing issues and continued to spike fevers on a daily basis. She was admitted to Children’s Hospital and her tests showed something like pneumonia in her lungs. Weeks passed and Alyssa spent her 18th birthday in the hospital. 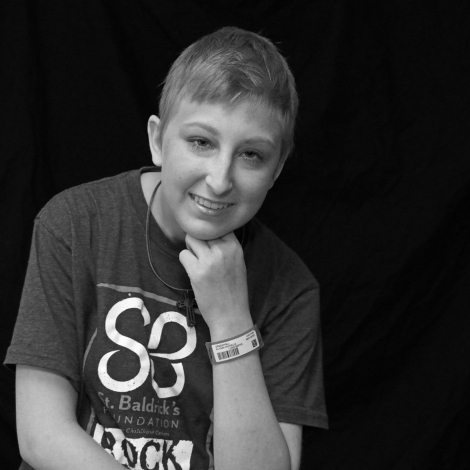 Then we got a diagnosis and it shocked us all – Alyssa had anaplastic large cell lymphoma. Alyssa began chemotherapy treatments immediately after the diagnosis. The first round seemed to go well, but, on August 8 we almost lost her. All of the medications she was on caused a severe reaction triggering a cardiac arrest. The doctors performed CPR for two minutes before restoring a normal heart rhythm with a shock to her heart. She spent the next several days sedated in the ICU and on a breathing tube. After her second round of chemo the fevers were gone and she no longer needed oxygen to breathe. She has finished up all of her chemo and there are no signs of lymphoma. She went back to volunteering at the St. Louis Children’s Hospital, which she had also done throughout her senior year. Recently, Alyssa has been having issues with her legs and we believe it is related to sarcoidosis. At times, she has to stay in the hospital due to high calcium levels. She will keep fighting and hopefully be attending Valparaiso University in the fall to work on her physician’s assistant degree. We formed a Light The Night team for her called “Team Alyssa” and we walked last year at the Light the Night Walk in St. Louis. Our team raised well over $1,000. We will be back this year with a bigger team and raising more money.